Picture - Vernon of 70 Squadron RAF, powered by Rolls-Royce Eagle engines. The Vickers Vernon was a British biplane cargo aircraft used by the Royal Air Force. It was the first dedicated troop transport of the RAF, entering service in 1921. 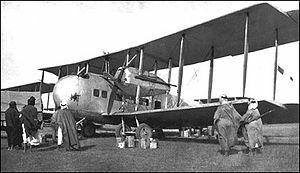 The Vernon was a development of the Vickers Vimy Commercial, a passenger variant of the famous Vickers Vimy bomber, and was powered by twin Napier Lion engines. 55 were built. In February 1923, in Iraq, Vernons of Nos. 45 and 70 Squadrons RAF airlifted nearly 500 troops to Kirkuk, after the civilian area of that town had been overrun by Kurdish forces. This was the first ever strategic airlift of troops. Vernons were replaced by Vickers Victorias from 1927. Vernon Mk I Twin-engined military transport aircraft for the RAF. Vernon Mk II Powered by two 450 hp (340 kW) Napier Lion II piston engines. Vernon Mk III Powered by two Napier Lion III piston engines.